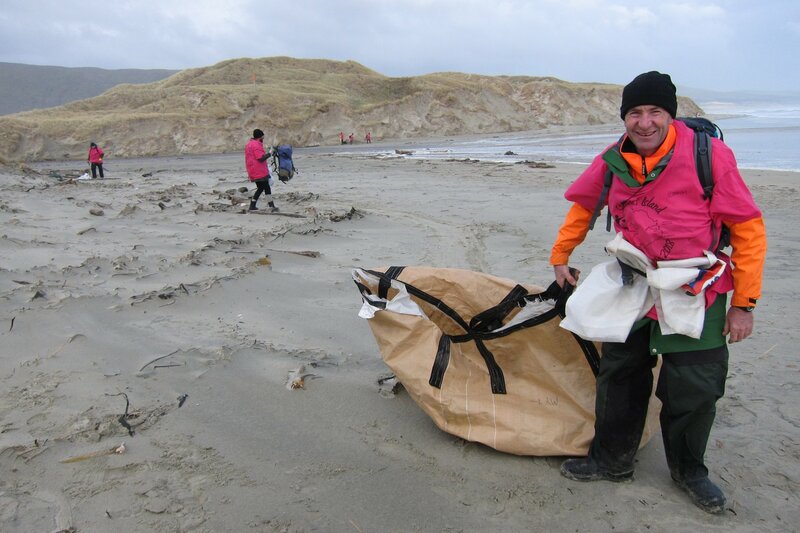 Some 16.6 tonnes of rubbish was removed from Stewart Island’s coastline in this year’s coastal clean-up. The Stewart Island clean-up began in 2014 when thirty volunteers over three days removed 20 tonnes of waste and in the past few weeks the Southern Coastal Charitable Trust, Environment Southland, locals, council staff and fishermen tackled the Island’s west coast again. The clean-up isn’t a cheap exercise with the operation costing around $110,000 funded by donations from the fishing industry and local Southland companies. The remote location and immense weight of the rubbish requires helicopters to transport volunteers and remove the waste itself. It is then transported by a freighter to Bluff where it is sorted for reuse, recycling, or disposal. Stewart Island appears to naturally collect rubbish with the tides. A large proportion of the waste collected this year was lost fishing gear but also everyday household items such as plastic bottles and lids. There were 130 fish bins collected including a few from companies in Australia and Argentina. Other interesting finds included a bottle of red wine still corked with barnacle and shellfish attached, as well as a bone of a seabird with its identification band still attached. The band was reported back to DOC and was found to be from a mollymawk banded at the Solanders in 1996. The seafood industry acknowledges its contribution to the problem and has demonstrated continued support for the cause. Deepwater Group sponsored the clean-up for a second year and a number of others in the industry supported the cause with donations and staff volunteering their time including Talley’s, Sanford, Fiordland Lobster, CRA8, Riverton Fishermen’s Company, Urwin and Company, and Ngai Tahu Seafood. Since the early days of the clean-up, New Zealand’s seafood industry has actively taken steps towards improving on-board practices in order to minimise and manage rubbish and lost gear.